Here a Little, There a Little: What Is Our Label? This last Sunday was Fast and Testimony meeting. One of the testimonies shared was about how people see us. The person bearing their testimony asked, "What is our label? How are we known? What is the first word people think when they think of us?" That got me thinking. How do people see me, and what is the first thing that comes to mind when they hear my name? While it's all fun to be known as "history nerd," or "Janeite;" to be thought of as "talkative" or "fun," what is it that I want to be known by? Because in the long run, no matter how much of a fan of Jane Austen I am, and no matter how "fun" I can be, those things aren't what truly matters in the long run. The brother sharing his testimony brought up a thought that I had never realized before. 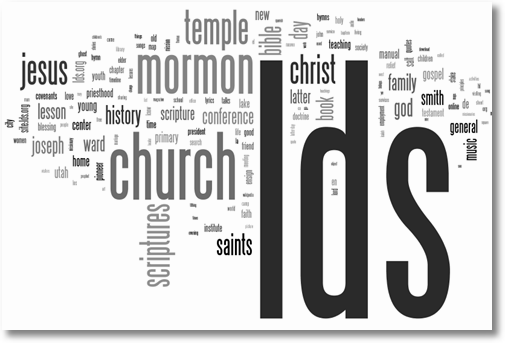 The Church's "logo" is written out "The Church of Jesus Christ of Latter-Day Saints." But of all those words, Jesus Christ is the biggest and stands out the most. When people look at our church, the first thing they see is the name of our Savior. When people look at me, I want them to "see His name" too. I want to live the kind of life that Christ would live. I know that I am far from perfect, but I also know that I can repent when I make mistakes, and through the Atonement, I can have help in becoming the best that I can be. According to my diligence and faith, I can become more Christ-like. While I sure hope that words like "nice" and "bright" and "trustworthy" come to mind when people think of me, I wouldn't want those to be the first words. What I want people to think is, "That is a girl who is striving to be like Christ." Nothing is easy. Nobody is flawless. But thorough the Atonement and faith, everyone can come unto Christ, and become more Christ-like. I know that God is watching over me, and wants me to succeed. I know that He sent His son, Jesus Christ, for us so that we can return to live with Him some day. I know that God is always there, and that he loves me. I never doubt that He loves me, no matter what I do. And that He is forever willing to listen to me when I call upon Him with faith and diligence. I love my Heavenly Father, and I know that He has such a beautiful plan for me, and for every single one of us.